National City's newest senior living development opened the first week of August. chIn 2011, students at nine Sweetwater Union High District schools will begin their learning year in upgraded, eco-friendly surroundings. High Tech High celebrated the grand opening of its new campus in Chula Vista at the end of March. On May 9, the American Institute of Architects (AIA) San Diego chapter announced the organizations' 2009 winners at its annual Design Awards Gala at The Neurosciences Institute in La Jolla. A distinguished panel of architects evaluated the nominated projects and selected this year's winners. Local landscape architects are taking recently implemented restrictions on outdoor water use in stride. With business down due to the recession, water restrictions are providing some opportunities for many in the industry. Corrections Corporation of America (CCA) still is considering the possible construction of a new prison facility in Otay Mesa. San Diego County's 343 single and multifamily building permits pulled in June were up 35 percent from May, bringing an end to the fourth-worst quarter this decade. The California Department of Transportation (Caltrans) has 20 major freeway projects totaling slightly over $1.56 billion going on in San Diego County. The South County's office and industrial market is smarting, but there may be hope by the middle of next year. Retail in the South Bay is a story of both trouble and success. Fifteen years after they last worked together on a mixed-use project, National City and Chula Vista are at it again. Nonresidential building permit spending in San Diego County jumped 63 percent from May to June, but it was not enough to pull its year-over-year totals above 2008. From an abandoned Bank of America building in Barrio Logan to its new state of the art facility in Otay Mesa, Circle Foods has come up in the world. In today's economy, long-term success for structural engineering businesses requires not only sophisticated design knowledge, but a leadership team and staff as durable as precast concrete. 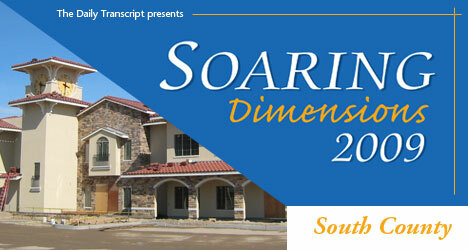 The Daily Transcript presents the 28th edition of Soaring Dimensions. Take a closer look at real estate and construction developments in all regions of the county. The Daily Transcript presents its 32nd edition of Soaring Dimensions. Take a closer look at real estate and construction developments in all regions of the county. The Daily Transcript presents its 31st edition of Soaring Dimensions. Take a closer look at real estate and construction developments in all regions of the county, plus special reports on the Port of San Diego, and Temecula and Murrieta. The Daily Transcript presents the 29th edition of Soaring Dimensions. Take a closer look at real estate and construction developments in all regions of the county, plus Temecula and Murrieta. The Daily Transcript presents its 25th edition of Soaring Dimensions, featuring in-depth coverage of the county's real estate and construction developments. Organized by region, this special report takes a closer look at local expansion and redevelopment projects, as well as ongoing and new plans.